One of the most famous gripes from my generation of skateboarders is about how the Internet ruined skateboarding. Every time I turn around I hear another 32-year-old skateboarder complaining about how kids today are ruined by having too much skating at their fingertips and that things will never be as good as they used to be when you had to buy a VHS copy of something and watch it four times a day because it was all you had. One of the huge positives about skateboarders today growing up with so much skateboarding on the Internet is that we're starting to see a generation that can identify with whatever era of skateboarding they're stoked on and see as much of it as they want. 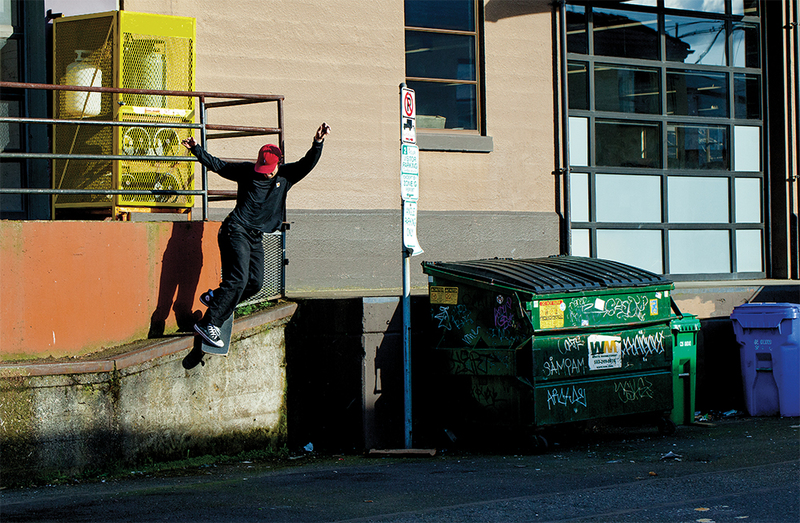 The Internet's transformation of the skate video has created skaters like Dane Brady. Dane grew up seeing whatever kind of skating he wanted with the click of a button, and he never had to stick a fork in a VCR to get a piece of tape unstuck when he wanted to watch Mike Carroll in Questionable. Luckily for us he watched a lot of that, and it helped shape him into the skateboarder he is today. Dane just came out with his first major video part in Polar's I Like It Here Inside My Mind, Don't Wake Me This Time, and in between finding impossible spots, hanging with his dog, Bruce, and recycling a perfect "The Cry" song, Dane managed to prove that the Internet may in fact be good for skateboarding—as long as it's used for good and not evil. Dane, how old are you, and where do you live? I'm 22 years old, and I live in Portland, Oregon. What were some skate videos you grew up watching? One of the videos I watched a lot was Plan B Questionable and older stuff like that. I watched a lot of random stuff I would come across on YouTube too. Some of the videos I wouldn't even be able to find again if I tried. So you grew up only watching skating on the internet and never had any hard copies of skate videos? No, not at all. I mean, for a good amount of time when I started skating I didn't have a shop that I would go to or anything, so I was just in my neighborhood doing my own thing and didn't know what was going on, so I would just watch random stuff on YouTube. Would you just search "skateboarding"? I don't even remember, maybe. Having videos from every generation at your fingertips seems to give your skating an older feel. Is that something you consciously try to do? I think it just comes from watching stuff from that time. If you're not particularly psyched on everything that's coming out in the time you're at, you can kind of just place yourself in an era that you like the most and stay there. Did you have any favorite pros growing up? It sounds crazy, but not really. I never really had that one guy that I wanted to be like. I did watch Mike Carroll's part in Questionable a lot. Do you keep up with current skating, or are you not really into it? I definitely keep up with it to a certain point. I can't really keep up with everything, and I don't think anyone can at this point. If it's someone I'm into, I'll take the time to check it out. I had to stop watching everything though. I still really like magazines though, and whenever we get new magazines at the shop [Cal's Pharmacy] I like to look at new magazines. Being from Portland, how did you get hooked up with Pontus Alv and Polar? I had just been filming a lot with my friend Tom [Bender] and my friend in New York asked me to send him some stuff, and he showed it to Aaron Herrington and his roommate Waylon Bone, and they saw something in it, so they showed it to Pontus, and I guess he saw something in it, and he told me he was interested in giving me boards. I kept filming and sending him clips until we met not too long after. Was it intimidating meeting Pontus for the first time? It was intimidating, but we got along right away. Did you know of Pontus from the old SF days with Mad Circle or see old footage in 411 or anything, or did you just know of him as Polar Pontus? I knew of him from Polar mostly. When I first saw stuff from Polar I was really psyched on it, but I didn't really know much about him or the other guys, so I did a little research on YouTube to see more of their stuff. You were just in Europe with those guys, right? How often do you get out there and get to skate with the team? Yeah, I was just in Paris for 12 days and then I spent two weeks in Sweden. I try to go out there as much as I can, and if there's a trip somewhere in Europe, I'll always try to go to Sweden for a while after. How was it filming for the Polar video? Was Pontus specific about any of the ways things were filmed or tricks or anything? Not really. My friend Tom and I filmed all of that stuff together on our own and just gave it to them, so we kind of did our own thing for it. Was it a deal where you guys just gave him the footage and you didn't see it again until the video premier? Nah, he definitely let everyone have a say in their parts and how they wanted it to be. It wasn't just like him making it a surprise. We all worked on it together. Did you have any say in picking your song, and did you know it was from an old H-Street video Hokus Pokus? Yeah. We kind of decided that it worked and I was stoked to use it. People will say that if a song has already been used that no one can ever use it again, but he thought it was cool to reuse something that can maybe remind people about an old video. Then they can go back and rewatch that video or maybe someone's never seen it before and it makes them go watch it for the first time and find out about a different type of skating. You looked really different throughout your part. How long were you filming for? Probably since I was 19, so about three years. A good amount of that footage was from the first footage I ever sent to those dudes. You have a rad Instagram account and you're always posting creative skate edits. Is it something you feel like as a sponsored skater you just need to do these days? I just do it because it's fun to make the videos and it's fun to film my friends skating. I like to watch my friends skate, and I can go back and watch old clips that I forgot about, and since I don't have a YouTube or anything, that's just where I post all the clips we get. You tend to blend into the videos of your friends and just sneak yourself in without ever really making it too clear who's who. Is that something you do on purpose? Do you like to be a little bit mysterious? I don't know about doing it on purpose, but I definitely overthink things a lot. I just like to post stuff of my friends. While we were shooting this interview, we never had a filmer with us. Is it normal for you to go out and do tricks without anyone to film? Yeah, kind of. I feel like most of the stuff I'm doing isn't too hard anyway [laughs]. I just like to skate, and if I film it, I can film it on whatever. It shouldn't really matter. Do you have anything coming up? Any more projects you're working on? I'm just trying to stay home and skate with my friends here as much as I can. Maybe try and film a little bit, but if it doesn't work, whatever. I just want to be skating. Who are some of your favorite ams right now? Emile Laurent, Jacob Nelson, and Logan Devlin. Who's an am who should be pro? Our Am Issue is on sale now.